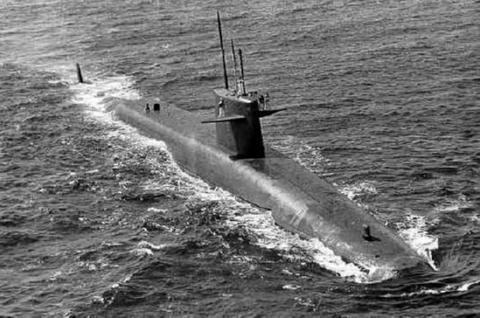 The USS JOHN ADAMS (SSBN-620), a Lafayette-class submarine, was commissioned on 12 MAY 1964. USS JOHN ADAMS was named for the second President of the US, and his son, the sixth President of the US. JOHN ADAMS was built at the Portsmouth Naval Shipyard, in Kittery, Maine, just north of Portsmouth, New Hampshire. After commissioning JOHN ADAMS joined the US Atlantic Ballistic Missile Submarine Fleet and commenced a series of deterrent patrols over the next four years. In 1968 JOHN ADAMS underwent a year long overhaul at Puget Sound Naval Shipyard in Bremerton, Washington, then returned to duty as a Pacific Fleet "Boomer". The next overhaul was performed at her building yard, Portsmouth Naval shipyard, and again, upon completion, JOHN ADAMS switched Fleets and was homeported at Charleston, SC. Finishing her career as an Atlantic "Boomer", USS JOHN ADAMS served her country for 24 years, 10 months and 12 days, until decommissioned on 24 MAR 1989. JOHN ADAMS again switched coasts, but this time for dismantling at Puget Sound Naval Shipyard. She was completely disposed of by 1996.